Witness the birth of an artistic legend, in Eisner Award–winning painter Alex Ross’s first professional work! As Skynet prepares a nuclear strike to wipe out humanity, John Connor leads a small team to destroy the sinister AI’s mainframe. 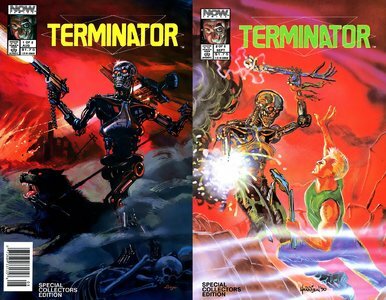 Now Comics' third Terminator series takes us back to the events that led up to the original terminator movie. It begins when an air battle causes a human pilot to crash into a quiet village, previously untouched by the war. The dying pilot reveals that he has a recorder that contains crucial information on the machines' plans. At all costs, this device must be given to the humans' leader, John Connor. 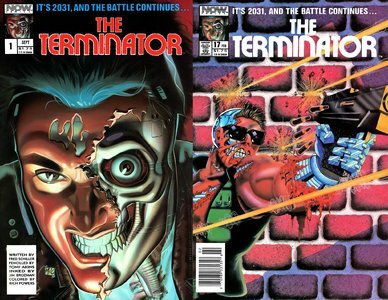 The two young men who discovered the pilot set off, braving the devastation of the terminators in order to get the device to Connor. In Connor's hands, the device reveals that the machines have found a way to travel back in time. So now, even though the humans are poised on the brink of victory, all their successes could be rewritten. 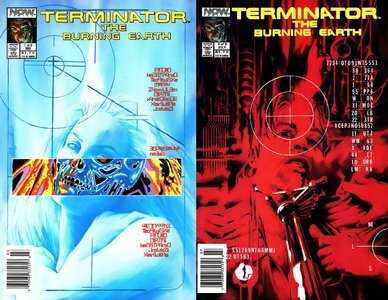 Featuring fully painted artwork, this two-issue series was written by master storyteller Chuck Dixon. The Year is 2031. It's been three years since Skynet's failed time-travel attempt to kill Sarah Connor. During these years, John Connor's organized force of freedom fighters have been beaten back, and reduced to rag-tag independent squads. Just south of Miami, Skynet has constructed a human replication complex--or Flesh Farm. The computer's goal, being to breed a new race of mankind. A race that is machine sympathetic. A Florida based pocket of freedom fighters, nicknamed Sarah's Slammers, has pledged to destroy this complex. With grim determination, but little in the way of firepower, they face this challenge--but it's clear from the start that this is a hopeless crusade. As determined as they are, they need help. Big-time help. Spin off comic based on the two 1980s Fright Night vampire movies, following the adventures of the movies' vampire slayers, Charlie Brewster and Peter Vincent, as they take on other denizens of the night, as well as more vampires.